Little helpers don’t help much. There are some people who are really good at keeping their kitchens clean. They have mastered the art of cleaning up as you cook, cleaning up after dinner, and wiping everything to a shine before bed. I am not one of those people. At. All. I fail miserably in the clean kitchen department every single day. I just can’t keep up! I think I was even worse before having kids, I’m not sure what my excuse was then. This picture is from when my daughter was one. I have an almost identical picture of my son, who is currently one. Cleaning with kids around certainly isn’t easy. My dirty dishes are constantly on my mind. I am always guilty when I think about the state of my kitchen. Always. Even when I’ve just cleaned my kitchen, I’m guilty because I know that it won’t last through the next meal. I will fail, once again. Dirty dishes mean that we have food to eat. Dirty dishes means that our cupboards aren’t bare. Dirty dishes means that I have a family around me who dirty the dishes. In our house, dirty dishes represent meals shared together. 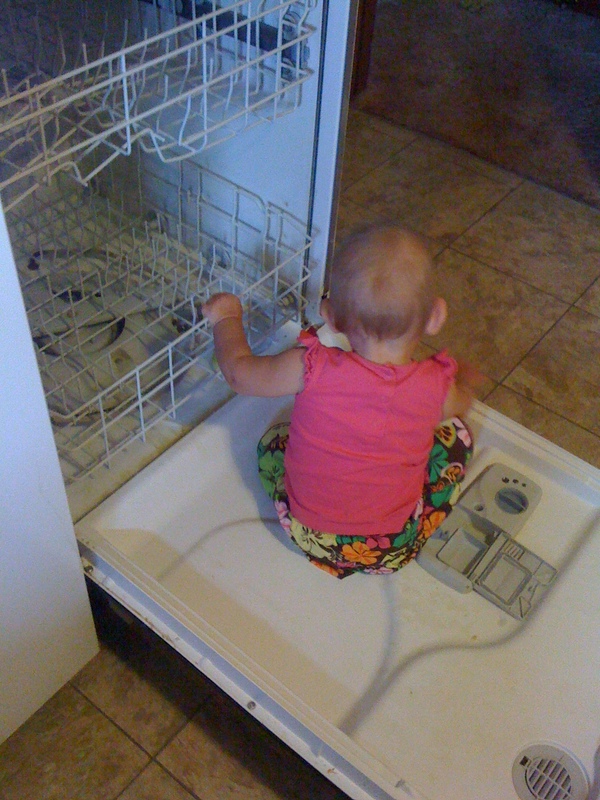 I am in a season of life when my kids are too little to help keep the kitchen clean. But this also means that we are in a season of life that isn’t filled with sports and extracurricular activities and friends and “busy-ness” that keeps us from meals together. We eat together nearly every night. We spend time together, enjoying our food and each other, discussing our days. Many people don’t get this chance. When I walk through my living room and find cereal bowls littering the floor, when I pick up my daughter’s room and find a random spoon hiding under her bed, when the dog wakes me up in the middle of the night because he is licking the dirty soup bowls left on the table, I know that I am blessed. How many kids go to school hungry in the morning because there is no cereal to eat? How many women do I personally know who would love to pick up random dirty spoons from their daughter’s room, because it means she has a daughter to pick up after? When will I understand that the fact that we have food left over to feed to our overweight dog means that we are some of the richest people on the planet? I worry that my dirty kitchen is unhealthy. I fear that I’m teaching my kids that cleanliness isn’t important. I struggle with thoughts about my worth when I can’t even keep up with something as simple as dishes. But my kitchen is (almost) never so unclean that it would be considered a health hazard. The time and attention that I spend playing with my kids after a long day of work and daycare is so much more valuable to them than lessons on cleanliness. My kids want me, their mommy, not a spotless kitchen. Keeping up with the dishes is not something that I was gifted with, but that’s okay, because I have so much more to offer the world than a clean kitchen. What guilt are you struggling with today? How can you change your thinking about that guilt and turn it into gratitude? Join us in this challenge as we actively choose to turn guilt into blessing. Oh gosh! Thank goodness I’m not the only one. I’m in love with my kitchen when it’s clean, but I’m exhausted be the time the meal is over and clean up had to wait…. And wait!